Im so excited to finally have time to add this highlight video to the blog. The bride and groom were one of the most tender couples I have had the pleasure of capturing. Louland Falls venue never disappoints, it is surrounded by sweeping views of Parleys Canyon and set against geometric, red-rock. There are multiple waterfalls and lots of greenery; it is the perfect setting to begin a "happily ever after". The couple had their family dogs walk down the aisle which I was more than delighted to see. This is the first time since my own wedding that I have seen canine-babies included in the wedding party. The ceremony glowed with sweet words and feelings, I have seldom seen guests so moved. 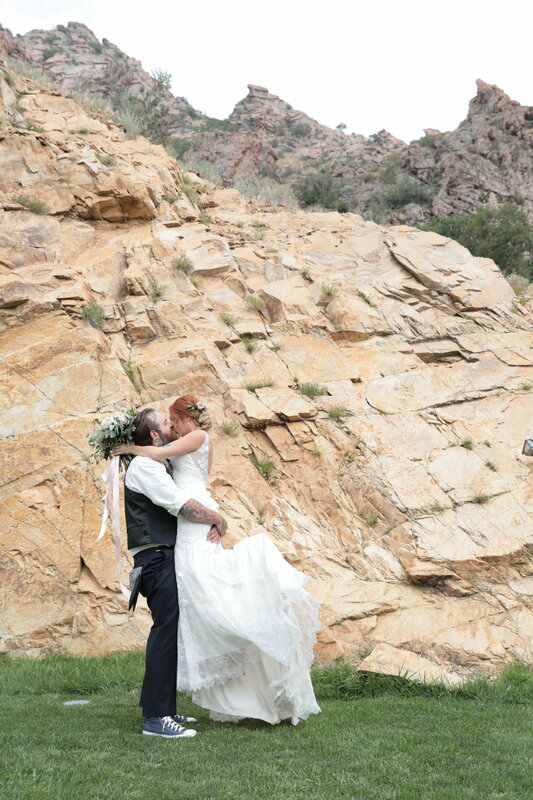 After the ceremony the bride and groom hiked up into the canyon for bridals while their guests began feasting on a vegan spread. Before the dancing began we all enjoyed the cake cutting and first dances. I cannot emphasize enough how loving the family and friends seemed to be toward one another. After several moving dances and toasts the DJ cranked the music and let people get wild. Aside form dancing, guests also enjoyed cake, a photo-booth, and exploring the grounds. Although elegance and fun are rarely, exclusive, this wedding was able to pull off both perfectly.